Donald Aboris popularly known as "Don Ok" of Fun House Entertainment has finally dropped his long anticipated single titled "Just Believe" produced by Mr.Moore after his hit song with Eriga Paperboi titled "Way Up" which is still trending worldwide. 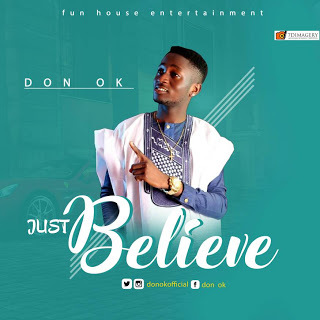 "Don Ok" is a talented and fast rising act with creativity hence he titled this single "Just Believe" believe me when i say this song is a hit. He showed how versatile and gifted he is on this jam and he’s ready to take the industry by storm with this latest release and more. DON OK has received recommendations from several industry heavyweights and he’s without doubt, he promises to keep putting out quality sound and dope lyrics to his fans. Download and share comments below!! !